NATO is an alliance transformed. Originally created to confront Soviet aggression, the North Atlantic Treaty Organization evolved in the 1990s as a military alliance with a broader agenda. Whether conducting combat operations in the Balkans or defending Turkey from an Iraqi threat in 2003, NATO continues to face new security challenges on several fronts. Although a number of studies have addressed NATO's historic evolution, conceptual changes, and military activities, none has considered the role in this transformation of the secretary general, who is most often seen as a minor player operating under severe political constraints. In "Diplomacy and War at NATO", Ryan C. Hendrickson examines the first four post-Cold War secretaries general and establishes their roles in moving the alliance toward military action. 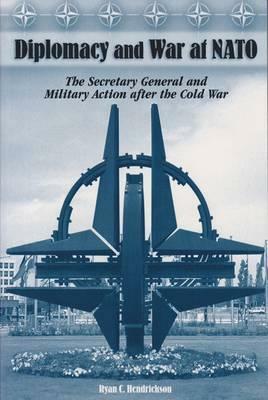 Drawing on interviews with former NATO ambassadors, alliance military leaders, and senior NATO officials, Hendrickson shows that these leaders played critical roles when military force was used and were often instrumental in promoting transatlantic consensus. Hendrickson offers a focus on actual diplomacy within NATO unmatched by any other study, providing previously unreported accounts of closed sessions of the North Atlantic Council to show how these four leaders differed in their impacts on the alliance but were all critical players in explaining how and when NATO used force. He examines Manfred Worner's role in moving the alliance toward military action in the Balkans; Willy Claes's influence in shaping alliance policies regarding NATO's 1995 bombing campaign on the Bosnian Serbs; Javier Solana's part in shaping political and military agendas in the Yugoslavian war; and George Robertson's efforts to promote consensus on the Iraqi issue, which culminated in NATO's decision to provide Turkey with military defensive measures. Through each case, Hendrickson demonstrates that the secretary general is often the central diplomat in generating cooperation within NATO. As the alliance has expanded its membership and undertaken new peacekeeping missions, it now confronts new threats in international security. "Diplomacy and War at NATO" offers readers a more complete understanding of the alliance's post-Cold War transformation as well as policy recommendations for the improvement of transatlantic tensions.